The frame and the rear swingarm are made entirely from carbon-fiber reinforced polymer (CFRP) and all lines have a strong forward momentum.The angular contours fit perfectly with Audi’s progressive design languageas as do the lights made up of homogenous LED bands and the red accents on the handlebar, brakes, seat and pedals. The 26-inch wheels, also made from CFRP, feature an “Audi ultra blade” design with broad spokes that have a large surface area optimized for power flow – the e-bike Wörthersee, which weighs in at just eleven kilograms without its electrical components, documents in all its details the brand’s expertise in ultra-lightweight design. 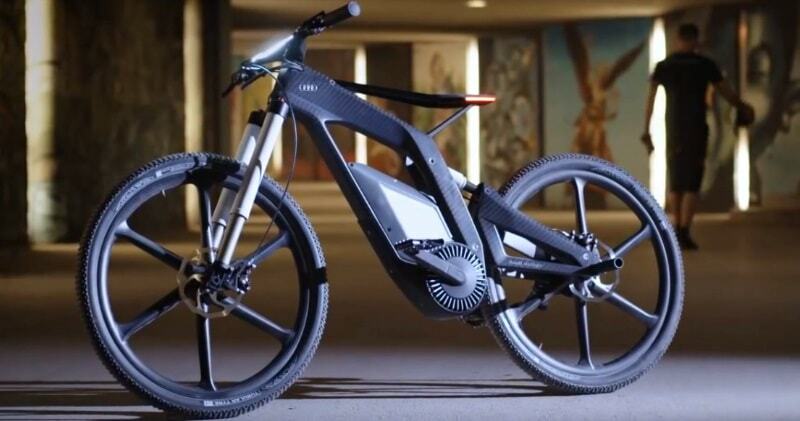 The 2.3 kW electric motor is connected to the bottom bracket and, when the e-bike is operating in “Pedelec” mode, enables a top speed of up to 80 km/h. The lithium-ion battery, mounted in the frame, delivers a range of up to 70 km.